Vasquez Heilig, J. (2011). As good as advertised? : Tracking urban student progress through high school in an environment of accountability. 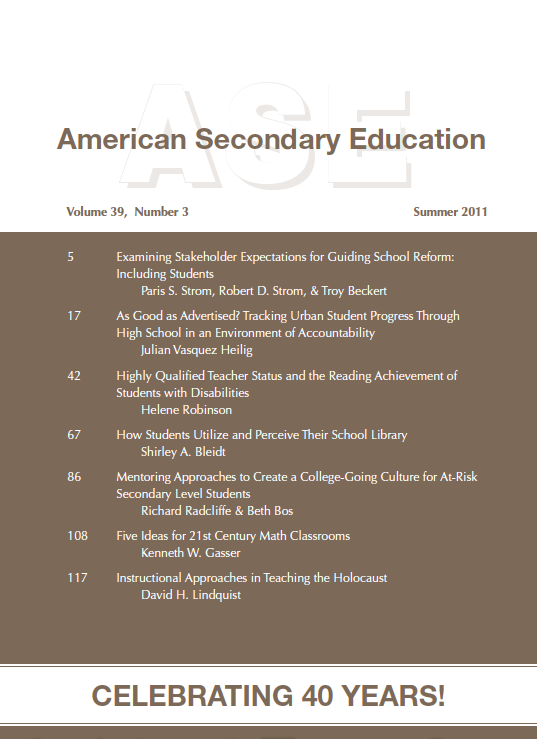 American Secondary Education, 39(3), 17-41. No Child Left Behind’s mandated high-stakes testing and accountability policies have pervaded districts and schools nationwide. To examine student progress and graduation in the midst of first generation Texas-style accountability, this study tracked individuals in a longitudinal dataset of over 45,000 high school students in the Houston Independent School District (HISD). Using descriptive cohort and inferential competing risk analyses, the study found evidence that student leavers were severely under-reported and graduation rates exaggerated. The majority of high school students in Houston actually failed to advance to graduation, and minority, LEP and economically disadvantaged students were disproportionately affected. An important question for the field, and the impending reauthorization of NCLB, is whether accountability policies are as good as advertised for urban schools.